For excellent home cleaning services, trust the cleaning professionals at Sears Maid Services. Our locally operated teams of cleaning professionals have years of experience with residential and commercial cleaning. If you need that one-time deep cleaning or if you're interested in regular cleaning services, count on the Sears Maid professionals. Our staff cleans bathrooms, kitchens, hallways, living rooms, dining rooms and more - everything from toilets to ovens and other hard-to-clean objects and areas like microwaves and dusty ceiling fans. Give us a call at (718) 527-0370. When you need regular home cleaning servicing on a schedule that suits your needs, Sears Maid Services can help. Our home cleaning staff offers convenient scheduling to work with your busy timetable. 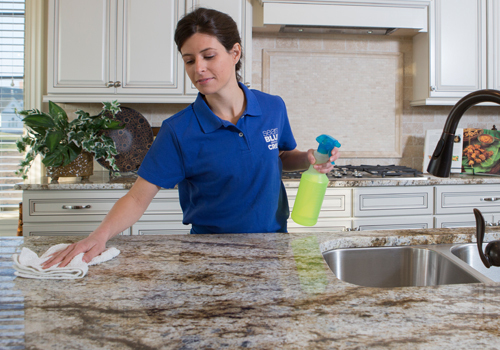 We offer weekly, bi-weekly, and monthly scheduling to accommodate a range of home and apartment owner cleaning needs. For a one-time, deep cleaning you need performed once or twice a year (like spring cleaning), we also offer an intensive Deep Cleaning service, which includes all of our normal cleaning benefits with additional attention given to other areas as well. A business's office space reflects its principles to clients, staff, and vendors. A dirty office space communicates disorder and can demoralize workers, while a clean, tidy office imparts order, boosts morale, and can maintain staff efficiency. Don't let your office become cluttered and unsanitary due to inconsistent cleaning. Instead, count on the professionals at Sears Maid Services to keep your office well cleaned and maintained. We train our employees in professional cleaning techniques to keep your office free from dust, kitchen stains, and full waste baskets. New home construction can be a messy business, and once all the carpet has been laid, drywall hung, and fixtures installed, most rooms will need ample cleaning. Most construction companies require cleaning services before a newly constructed home can be shown to prospective buyers, realtors, or inspectors. For excellent post-construction cleaning services, you can call on the cleaning professionals from Sears Maid Services. Our cleaning experts have experience with cleaning the mess left behind in newly constructed homes: we'll vacuum, mop, and sweep all flooring; remove dust, debris, and silicon from the site; and wash and sanitize all surfaces. At Sears Maid Services, we know the intimacy involved with letting others into your home for cleaning - that's why we make professional integrity and expertise cornerstones of our business. Sears Maid Services knows that succeeding in the home cleaning industry doesn't just mean performing our work well, but also cultivating trusting relationships with our clients. To accomplish this, we rigorously screen prospective employees with a background check during the hiring process. We vet each potential employee to reduce the possibility of professional misconduct. Likewise, once hired, each new employee undergoes extensive on-site and off-site training to ensure she develops the knowledge and skills required to deliver excellent results on the job. We're so confident in the quality of our work that we guarantee our results. Not satisfied with a home cleaning service? No problem. Just call to describe your problem within twenty-four hours of your last cleaning and we'll send an associate to inspect our work. If it turns out we missed something, we'll return to correct the mistake at no extra charge to you. We love Cleaning for a Reason! It can be very difficult to keep the home clean under regular circumstances but when cancer arrives in the home it makes it even more difficult. We have partnered with the organization Cleaning for a Reason to giveaway free cleanings each month to Women who have been impacted by Cancer. One of our goals, outside of providing best in class cleaning services to our customers, is to give back to our community. We feel as a local business in Queens it's important to give back to our local community. Thank you to all of our customers who allow us to provide this great service to cancer patients and survivors! Read our Reveiws on Yelp! We take great pride in providing best in class house cleaning and commercial cleaning services to Queens and the surrounding areas. Take a moment to read our reviews on Yelp and add one if we've provided great service in your home or business.